How Does Children get Benefits of Yoga? If you have a child with autism, you understand the importance of building a calming, predictable environment. Due to a highly sensitive nervous system, a child with autism experiences normal day-to-day interactions with an intensity that can lead to anxiety and upset. 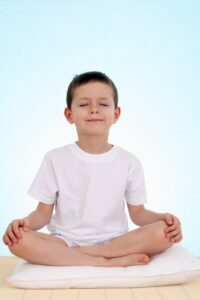 A yoga practice can provide these children with self-calming coping skills, as well as numerous other mind and body benefits that enhance their wellbeing. As anyone who has tumbled through his or her first yoga class can attest to, yoga offers an opportunity to focus on body awareness, coordination, and balance. Children with autism often experience delayed motor development and low muscle tone. When practicing yoga, the child not only strengthens his or her muscles, but also develops the ability to participate in complex movements and poses. Even more, children learn how to follow the instructor’s movements, increasing their imitation skills. Imitation development is crucial for cognitive growth and social communication, such as the use of language. While children with autism exhibit a deficit in imitation, the practice of yoga can actually combat this and lead to growth. Deep breathing exercises, as well as a setting of dim lights and soft music, foster a calm and relaxing experience to quiet down from the busyness of the day. Usually, the yoga studio will arrange everything to be predictable for the child, just as it was at the last class. The instructors understand that many children with autism fear change and uncertainty, often holding on to strict routines for comfort. Therefore, the class is held the same day and time of every week and the instructors (usually one-on-one for each child) are the same. Studios often go as far as to maintain the exact room, mat layout, music, and pose sequences for each class. In this tranquil setting, all focus is on releasing anxiety, finding inner peace, and gaining emotional awareness. Instead of feeling distracted by an overload of stimuli, the child can be solely with him or herself. With the minimalist setup and slow, rhythmic practice, the child strengthens an ability to focus and keep attention. Yoga helps so many people adjust to life’s ups and downs. A child with autism often feels life’s changes especially deeply; yoga could be the key to helping your child cope with this, and even more, feel truly empowered and happy.